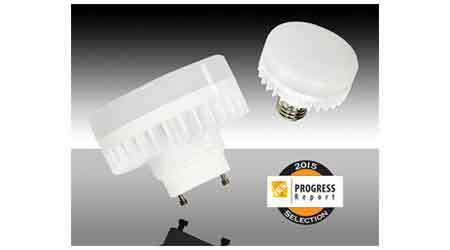 The LED Puck Lamp has been recognized by the Illuminating Engineering Society (IES) Progress Committee as providing advancements in the art and science of lighting, and will be featured in the prestigious Progress Report for 2015. The Puck Lamp is the industry’s first GU24-base light source rated for use in fully enclosed luminaires to earn placement on the Energy Star certified subcomponent database. Available in two bases (GU24 and E26) and two correlated color temperatures (2,700K, 3,000K), the ultra-compact lamp was designed to provide efficient, quality LED lighting for shallow fixtures such as closet lights, ceiling fans, outdoor porch lights and torchieres. The Puck Lamp delivers 800 lumens, an output equivalent to that of a 60-watt incandescent lamp, from a source that is roughly the size of a hockey puck.